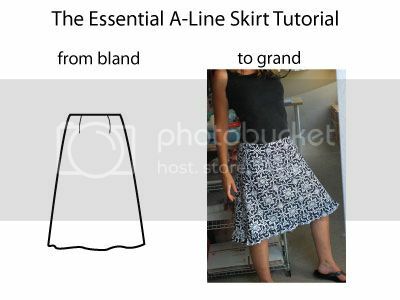 The Essential A-Line Skirt, Part 1: Preparing your pattern - Stop staring and start sewing! Use Butterick 4461 or 3597 (any basic a-line skirt pattern should do though). 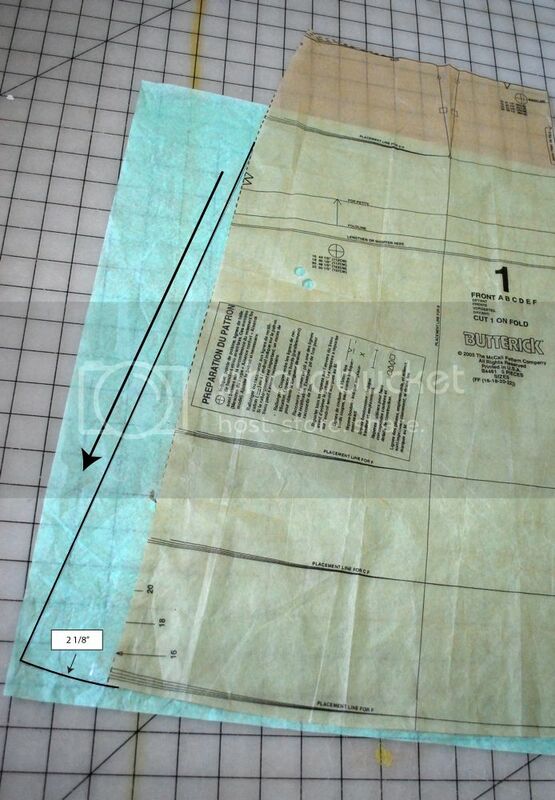 I'm using Butterick 4461 in this tutorial. Okay! This is my favorite style of skirt and I'm excited to share it with you! My favorite thing about this skirt is the way it lays flat at the hips so it doesn't add unwanted "fluff" like a gathered skirt does (which I haven't worn since I started having kids). I always make it with a lining because it's cheap and fast and then I never have to find a slip. I've made a lot of very different looking skirts from this one basic pattern so it has served me very well. In this post I'm going to show you how I remove the back seam and add width to the bottom of the skirt pattern so that it becomes a simple, 2 piece pattern and doesn't look like a fabric tube instead of a skirt. In the following skirt posts I will begin to show you some fun variations you can make with this pattern. 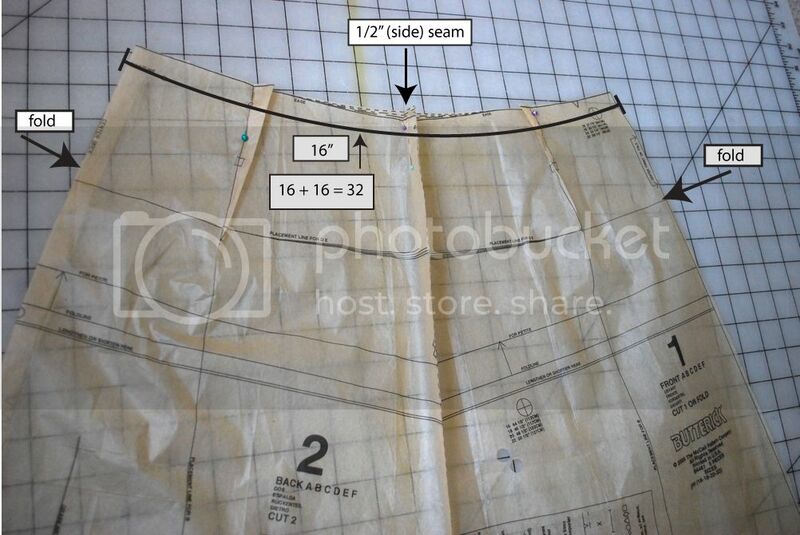 When choosing your pattern size I recommend using your hip measurements as your guide. Adjusting the waist when your pattern is cut is much easier than adjusting the hips (if you're between sizes, chose UP and adjust from there). You'll want your finished skirt to sit 1 inch below your waist. Tie a string around your waist and then measure 1 inch under that to get the correct waist measurement for your finished skirt. 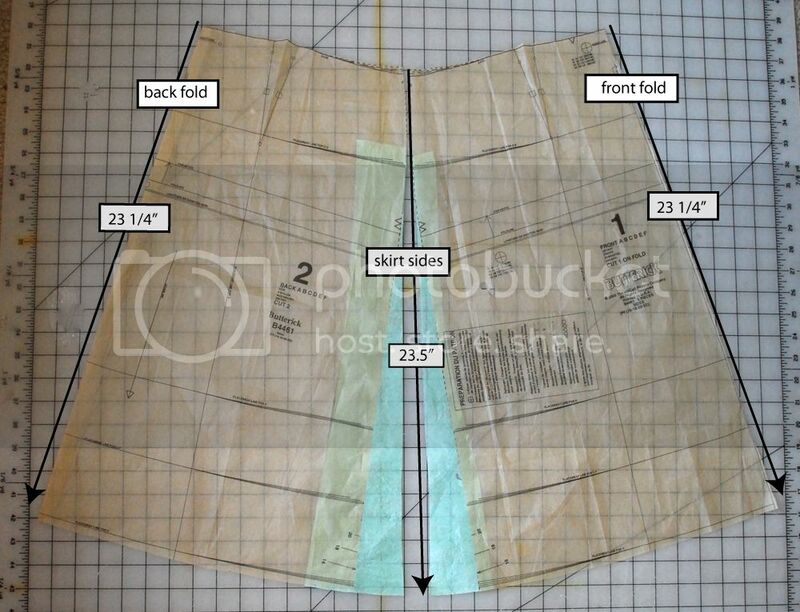 I want the bottom of my unfinished skirt to land around the center of my knees because it's an easy length to add or subtract from (when you make variations), so I cut my pattern pieces slightly below the "view F" cutting line. 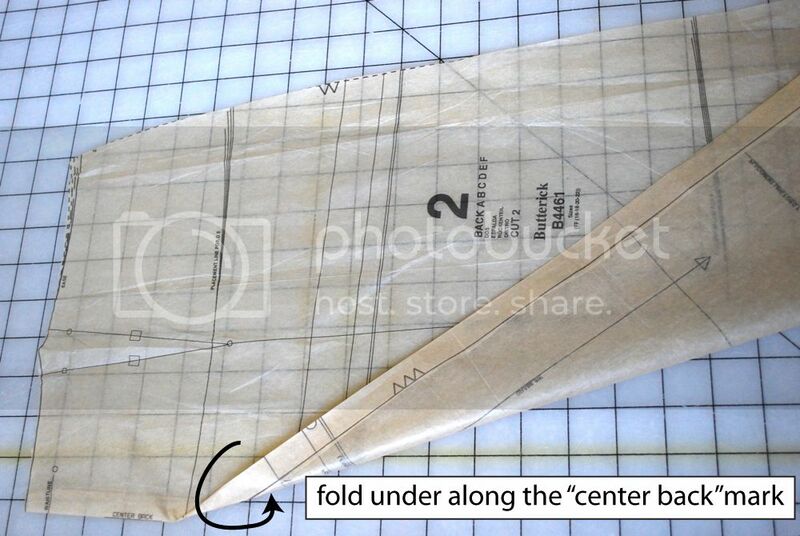 Once you cut your 2 pattern pieces out (ignore the little facing pieces) fold under 5/8 inch along the straight edge of the BACK piece using the "center back" line at your guide. This is the line where you would normally have a seam but since I'm removing the seam (and putting the zipper on the side), you need to remove the part that would have been the seam allowance. You can actually just cut this part off instead of folding it but it's a good idea to leave it folded on your first try in case you need to make some adjustments at the back of your skirt after your first try. On your pattern pieces fold your darts and pin them, then pin the side seams together (I use a 1/2" seam allowance just to keep it simple). Measure across at a curve along the "waist" line. Your goal is to get a number that is 1/2 of the measurement you got when you measured below your waist. If it's too big you need to "shave" a little bit off of both sides of each pattern piece and pin and measure again. My finished measurement needs to be 32 inches around so once I got 1 measurement of 16" (half of 32 you know) inches across I knew I was on the right track. Now you can remove the pins from your dart lines but leave that 5/8" fold (that you made on the back center) in place. Now I want to extend the bottom of the skirt out because I'm of the opinion that a skirt that's a nice, bigger width at the bottom helps make the top look narrower (that's my story anyway). Tape a piece of tissue or tracing paper onto the outer side of both skirt pieces and trace a straight line from right where the hip curves down on the pattern (I used a straight ruler and a pen for this). I just used some old tissue paper I ironed out. Mine extended out 2 1/8 inches at the bottom side. This number will vary with different patterns but the goal is to make the skirt flare from the side and not hug the hip. Now make sure your pattern pieces are the same length. It will be longer where the side seams are because the length needs to compensate for the curve of your hips (which lift it a little on the sides). So now I have my pattern pieces ready to go. Keep in mind your first skirt will not be as great as your second skirt so you may want to start out with "practice" fabric (not too "practic-y" though because you may end up loving it). You'll need 1.5 yards of fabric (for the main skirt) and 1 yard of a solid fabric (for the lining) on the first skirt I'll demonstrate (the one in the picture on top). Pre-wash it and iron it and I'll be back real soon with instructions!